Need to relieve some stress? Every once in a while, a good dose of mindless gaming violence is just what the doctor ordered. Enter Thing Thing Arena 3, the latest installment of the incredibly gory arena-shooter series by Diseased Productions developer, Sean McGee. Fans of the series will be pleased to note that, like the previous “Thing Thing Arena” games, part 3 continues to deliver the same frenetic gameplay, stylized (and customizable) characters, an obscene variety of weapons, and blood and giblets galore. The core difference between TTA3 and other Thing Thing Arena games is that your score is based on killing with style instead of body-count. You can play a “Custom Match,” which allows you to select from an assortment of arena types and levels, and how long each “round” will last. Alternatively, you can simply select the “Quick Match” option, which will randomly generate your “mission” parameters. Although the game begins with a cutscene, there’s not much story to speak of. Those looking for a similar story-based game should check out McGee's Thing Thing 4. It’s just as violently crazy, but (like his other games without the “arena” moniker) is tied together by a plot. The weapons are satisfying to use, and the carnage that ensues achieves a level of gory absurdity that’s pretty amusing. Blood-spatters, enemy corpses, and weapons are all persistent, meaning that the arena will start to look like a cartoon abattoir after just a minute or two of fighting. Good times! 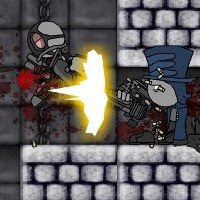 Thing Thing Arena 3 is a game that compels you to reach down into the nearest pile of gore, grab the biggest gun you can, and fire away until your trigger-finger falls off.